Do you ever have those moments where you weren't planning on doing something different, but you just get an idea rolling and you suddenly LOVE it?? I had one of those moments over the weekend, putting up our Christmas wreath! Ok, I'll admit- I'm more sentimental than I realized, and practical could be my middle name. If I hadn't started blogging, I probably would have put up the wreath we've had for the last 9 years and wished I had some extra cash to replace it. There's nothing wrong with it. It's pretty, I still like it. But not in love with it anymore. I think a front door wreath should give you a hint to the decor inside. Since I'm switching out alot of the gold tones, I wasn't loving all the gold on the wreath. Yes, it's a bit rustic, but it was also saying "Victorian". How about silver and vintage? I think the creative juices really start to go when I have a limited budget- which also gets me a little more excited making it up as I go!! Here's where I started from. Silver....what could I do to add some silver to the front door? Well, I had these bicycle baskets that I got at thrift shop a few months ago. $5.95 for the set. How about using one of these for the base for my new "wreath"?? The branches we trimmed off the base of our Christmas tree would be perfect. After I trimmed off some pieces, I hung up the basket with red and white gingham ribbon. I've been using it through out the Christmas decor, so I like that the front door gives the hint of what's inside. I had to buy another roll of it from Michael's- I've used the rest of it up in the house! $3.99 for the roll. I like that it's so cheery and classic! I hung it up by stringing it through the basket and then using some flat thumb tacks into the top of the door. I added in a few more of my holiday decorating staples: red berries and pinecones. I also thought there needed to be a little shine / glitz, so the silver ornament also came on to the project. would you like to see a before and after? I like that I got to be creative and thrifty, and create something unique to welcome our family and guests! LOVE IT!!! This is such an awesome idea and it looks outstanding! Can I featured it onmy blog? I love it!!! What a great idea and your arrangement is perfect! I love the ribbon!! I love it! What a great way to use the basket! Any plans for the other half? What a great 'wreath'! Nothing like using what you have :-) Excellent job, Happy Holidays! A very unique and fun door front! It has such a welcoming and cheery look! Oh so clever! Don't want to miss any of your ideas, so I'm your newest friend. I love it! 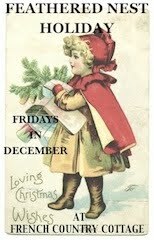 Vintage is fun and I know all about trying something new on a budget that's for sure:) Happy Holidays! I love it! Isn't it amazing what you can create when you are on a "tight" budget? You did a great job! So creative and so cute!! SO ORIGINAL! officially I LOVE WITH THIS! LOVVVVVE it! Of course, I adore anything thrifty and this is so unique. What a conversation item too. Such an original and fabulous idea. It looks so welcoming! I LOVE it! Such a great idea to use the bike basket! Thanks for sharing. I've beed scanning thru your creative blog and had to stop here to comment on how much I love this idea! I've pinned it to remember. Red gingham just makes my heart go pitter patter! I love this project...gonna have to copy this one! at Christmas of course...or wait...I bet fall leaves and gourds would be great in that basket too! I'm gonna head to the antique store and look for something like that. Smart idea with using the basket. So original and it looks so great.